This is the last of eight previews looking at WSU’s position-by-position prospects for the upcoming season. Today: Quarterbacks. PULLMAN – For the quarterbacks who propel Washington State’s Air Raid offense, record passing numbers are simply an occupational byproduct. 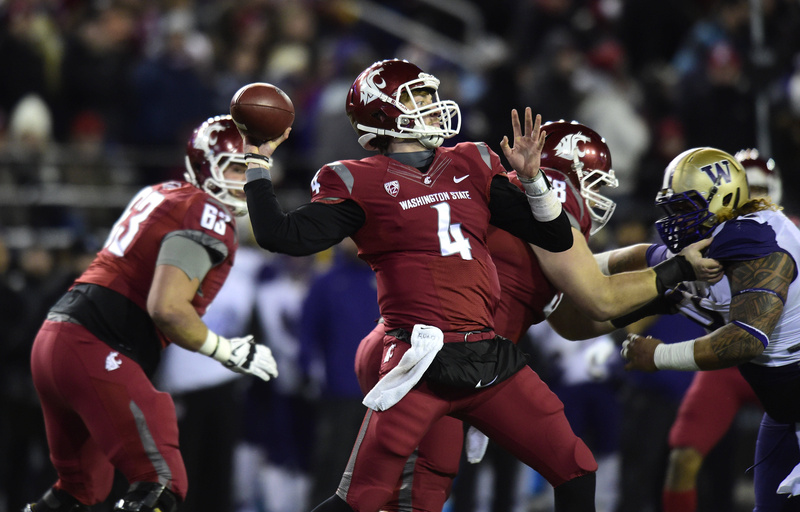 Connor Halliday constantly updated WSU’s game notes and media guides, routinely taking down Pac-12 and national records on his way to school records in passing yards, touchdowns, completions, attempts and percentage of passes completed. He broke a 24-year record for most passing yards in a game, and might well own the NCAA’s record for most passing yards in a career had his season not ended in the ninth game because of a broken ankle against USC. While Halliday’s injury ended the records chase for Mike Leach’s first multiyear starting quarterback at WSU, it gave his second one a head start on his own stats binge. Luke Falk filled in with Halliday out for the final three games last year, and the redshirt sophomore has already passed for 1,859 yards and 13 touchdowns in his embryonic career. Falk is most often praised by coaches for his willingness to put in long hours studying film of his own offense and opposing defenses, which yield a very prepared quarterback on game day. Any questions about his ability to compete at a high level were surely answered after his first start, in which he threw for 471 yards and five touchdowns in a win at Oregon State and was then named the Pac-12 Player of the Week. The next two games, losses to Arizona State and Washington, showed the areas in which Falk still needed polishing – he combined to throw six interceptions. The good news is that turnovers were rarely an issue for Falk during his first offseason preparing to be a starting quarterback, albeit while in competition with Peyton Bender. If Falk wins the job it will mean his command of the Air Raid and decision-making outweighed the superior natural throwing ability of Bender. For Falk to keep the job long enough to break Halliday’s career records, however, he’ll have to hold off Bender, who is improving in the areas where Falk currently holds an advantage. Falk also adds a dimension to the offense with his ability to run for yards – Leach prefers he doesn’t unless he can pick up 15, and while it’s rare that Falk has that much space, he can frequently get 7 or 8 and get out of bounds. For this year at least, whoever wins the job is likely to have a full year to pile up gaudy statistics, barring injury or disastrous play. In addition to the desire to have continuity in the offense’s natural leadership role, the backup won’t get the same opportunities and first-unit reps in practice as the starter. With a deep receiver corps full of playmakers, the quarterback won’t have to be a hero who completes lots of difficult throws to amass receiving yards and touchdowns.